After thirty-six years of coaching in the NCAA and forty national championships, it was not until five years after John McDonnell’s retirement that the story of the most successful coach in American collegiate sports history was finally written. In March 2013 the University of Arkansas Press published the biography of “John McDonnell: The Most Successful Coach in NCAA History” (available on Amazon and bookstores in the United States) to critical acclaim in the United States. It is the story of a man who grew up in the most trying conditions in County Mayo, Ireland during the Second World War before graduating high school and becoming involved in athletics as an international level distance athlete in the 1960s. From there he was given the opportunity to attend school on a scholarship in the United States and received a firsthand look at the racial tensions prevalent in the American South during that time. 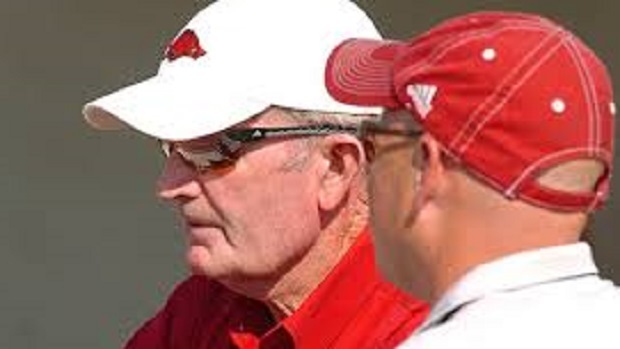 After a successful collegiate career in Louisiana that saw him capture All-American honors, John was hired in 1972 as head cross country coach at the place that reminded him most of home: Arkansas. It certainly was not a highly sought position – the program had scored one point at the previous season’s Southwest Conference Championships – but within two years John’s team won its first of thirty-six consecutive conference cross country championship (a Division-I record), within seven years Arkansas won its first track and field conference title with John now as head coach, and by 1984 the program had reached the pinnacle: an NCAA National Championship. It was a formula John repeated over an unprecedented forty times during the next quarter century in indoor and outdoor track as well as cross country, managing to mentor nearly two dozen All-Americans along the way. John McDonnell’s story is remarkable not for the amount of times he won – and he won many championships with his athletes – but for his ability to help his athletes meet their personal potential of excellence on and off the track. There were certainly no shortage of Canadians he mentored during such a prolific career – Olympians such as Doug Consiglio, Edrick Floreal, Graham Hood, Sean Kaley – as well as NCAA champions such as Matt Kerr and Jason Bunston (whose exclusion from the 1996 Olympics remains contentious to this day). Although each of them struggled at first to adapt to the mountain of training at Arkansas, it was McDonnell’s patience with each of them that paid dividends. Above all he had a gift for motivation. Doug Consiglio remembers coming into John’s office on the Monday after running a Canadian record 3:55 mile in 1986. Consiglio may have been expecting high fives and congratulations but he got a serving of humble pie and -- with teammate Frank O’Mara having run 3:52 in the same race – all the more motivation to get better. Between the dozens of Olympians and former athletes currently coaching in the NCAA, John McDonnell left a legacy that went beyond titles and personal records. It was never winning that satisfied him most as much as it was the fulfillment of individual and collective potential. It is safe to say that Coach McDonnell helped many of his student athletes do just that.